What it is IS FOOTBALL!!!!! FINALLY, the long days of summer are over and “the boys” are back on the Ponderosa!!! 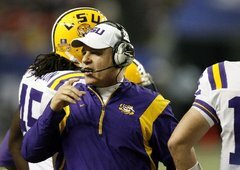 BATON ROUGE — LSU put down a marker Wednesday that an 8-5 record in football is unacceptable. Looking bronzed and fit, clad in shorts and a crisp, sky-blue LSU beach shirt, Miles stood on the indoor practice field graced by banners representing the Southeastern Conference and three national titles LSU has won. There is no banner in the indoor facility marking the 2008 season, one that finished 8-5, including a 38-3 win over physically outclassed Georgia Tech in the Chick-fil-A Bowl at the Georgia Dome in Atlanta. The Tigers, seeking to avenge that mediocrity, start camp with new defensive coaches and a more settled atmosphere around the critical position of quarterback. New defensive coordinator John Chavis starts his first regular season in Baton Rouge after almost 14 years crafting well-respected defenses at Tennessee. In 10 of those years, the Volunteers finished as one of the four best defensive units in the SEC; last season Tennessee ranked third nationally in total defense despite a 5-7 record.